Do you have any questions you want to directly ask the organizers of the convention? Please contact us here. 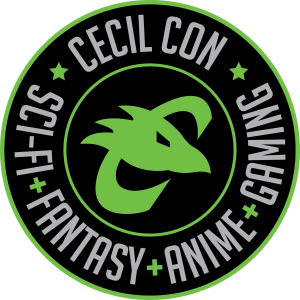 Cecil Con is a family-friendly fantasy, sci-fi, anime and gaming convention at Cecil College in North East, MD. The admission is only $5-$12! Admission is FREE for Cecil College Students, Faculty, and Staff, Children aged 3 and under, and persons over the age of 65. ID will need to be shown for adults over 65 and Cecil College personnel at the registration table the day of the con. Cecil Con made its debut five years ago and is back for its SIXTH year! Building on last year’s success, the convention is looking to grow. We’re going to have two days with an Artist Alley/Vendor’s Hall, a Tabletop Game Center (with tournaments), a Video Game Center (with tournaments), two panel rooms, two workshop rooms, cosplay contests, all day anime rooms, special guests and so much more! Cecil Con is going to be even better than before! Cecil Con Art Show: Opening Reception April 12th from 4-8pm. We’re kicking off Cecil Con 2019 with a showcase of sci-fi, fantasy, anime, and gaming related artwork. We’re pleased to invite entries for the 3rd annual art show, which will be presented at the Milburn Stone Gallery, located on the Cecil College Main Campus. We’re accepting submissions for 2D or 3D works including but not limited to painting, sculpture, ceramics, textiles, jewelry, photography, drawing, digital, etc. All works submitted must be available for the dates specified. Visit the Art Show page here. Shawn is a HUGE advocate for Cecil Con and as the convention got larger he brought it into the fold of his department. Under Shawn’s leadership, the Lifelong Learning department offers courses in personal enrichment, youth education, senior educations, and summer camps. Cecil Con is now one of the 6 major events on campus that Shawn oversees. Meredith is a proud alumni and former staff member of Cecil College, who holds 4 associate degrees from the Visual Communications Program, and a bachelor’s degree in Integrated Arts from the University of Baltimore. Meredith is also the owner of the multimedia studio Grunge Muffin Designs as well as the Event Coordinator for Delaware Fun-A-Day. Matt has been an avid board game enthusiast since late 2014. He has played hundreds of modern board and card games and has taught hundreds of people. Light games, heavy games, and most all themes interest him. He recommends JonGetsGames, GameBoyGeek, Dice Tower, Watch It Played, and ManVsMeeple as primary Youtube media sources for news and reviews for the hobby. Brandon is the Creative Director of Interactive Media Productions at the School of Tech and a pro gamer on the Gears of War circuit. He graduated with a bachelor’s in Simulation and Digital Entertainment from the Univ. of Baltimore, and is also an alumni with 1 associate and 3 certificates from the Cecil College VCP. He was a staff member and adjunct at CC for 10 years. James is a Cecil College student and best known as the founder of Cecil Con. James brought the idea of a convention to the Student Life department on campus and started the wheels of motion toward the Cecil Con we have today. You will often see James representing Cecil Con at other conventions, and if you do, say hello, he’s quick with a smile. Cierra grew up watching anime and playing video games, paving the way for her love of all things nerdy. She comes to us with veteran experience of conventions, cosplay and anime. She has a profound love for the Lord of the Rings, BTS, and her corgi, Mushu. Her wish is that her well rounded knowledge and enthusiasm will help Cecil Con be even greater every year. Megan is an alumni of Cecil College with two Associates Degrees in Accounting and Computerized Accounting. She has been a part of Cecil Con from its inception. She enjoys Reading, Anime, Video Games and Board Games.